Don't let this man's gentle demeanor fool you: He is on a mission to be the biggest, baddest man onstage. People tell him to make his move now, but he'll make it when he's damn well ready. Akim Williams, one of the strongest, most muscular men in the IFBB pro ranks, rolls into Bev Francis Powerhouse Gym in Syosset, Long Island, weighing a cool 295 pounds and ready to train triceps. Coming off a very successful June, with back-to-back second place finishes in Toronto and at the Muscle Mayhem Pro in Indiana, he's ready to take his place atop the world's biggest stages—but not quite yet. Williams has the momentum—and the points—to compete at the Olympia this September, but he's got other plans. He intends to focus solely on doing what it takes to dominate a super-competitive sport where hard work is the cost of admission, but genetics calls the shots. One look at Williams and you can't help but be reminded of Victor Richards, a super freak on the bodybuilding scene back in the late 80s and early 90s who was known for his crazy mass and strength. Richards never made a dent on a professional bodybuilding stage; in fact, he chose to go to Nigeria in 1992 to qualify to turn pro. Williams, on the other hand, earned his IFBB pro card by taking the superheavyweight class and overall title at the 2013 North American Championship. He's just as strong—if not stronger—than Richards was in his heyday, having pumped out multiple repetitions of 600-pound squats and 700-pound deadlifts with no belt or knee wraps. There are only a handful of bodybuilders today who would be unstoppable if they could put together all the elements needed to seize the stage. Cedric McMillan and Mamdouh "Big Ramy" Elssbiay immediately spring to mind. Williams belongs on this shortlist. Like McMillan and Big Ramy, he has all the muscle mass he needs. If he ever nails his conditioning onstage, there may be no stopping him. 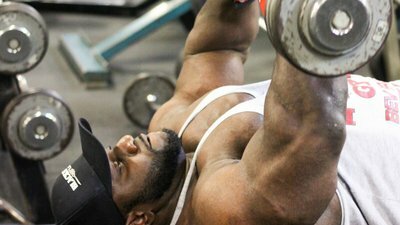 As a professional bodybuilder, Williams' gym is his office. And when he's in his office, he's never without a kind word or two for fans or friends who approach him between sets. Other bodybuilders, some less successful onstage or lacking as complete of a physique as Williams, can be much less approachable in the gym. Williams is friendly, and when a couple comes up to him between sets today, he's quick with a smile and some encouraging words. He even agrees to pose for some selfies with his visitors, but then it's back to his workout. Watching Williams work out is truly inspirational. Talking to him, you realize that, despite his intimidating size and strength, this is a genuinely kind and gentle man—until he starts his reps. Once the weight begins to move, he's a study in iron-willed focus and concentration. Williams warms up his triceps with 4 sets of seated triceps push-downs. He presses the weight down and squeezes the triceps briefly before returning to the starting position. He carefully avoids locking out his arms to avoid the excessive strain it would impart on his joints. Instead, he keeps continuous tension on his triceps as he moves smoothly and steadily through the exercise. He aims for 20-30 reps per set to pump lots of blood into the back of his arms. Today, Williams will use an EZ curl bar for both exercises. He lies back on a flat bench, moves the bar into position, and grips it with his hands 6-8 inches apart. He lowers the bar toward his forehead, stopping just as he reaches the brim of his baseball cap. When he extends the weight back up, he once again avoids a full lockout. He aims for 15-20 reps. Having completed them, he lowers the EZ curl bar to his chest and pumps out 15-20 close-grip barbell bench press reps. He completes four sets of each exercise. Williams does this exercise using two different grips and two different attachments. For his first 4 sets, he uses a supinated grip (palms facing up) with a multi-exercise bar, an attachment that resembles a wide letter "w." He pumps out 20 reps in a smooth, continuous fashion, further engorging the muscles with blood and lactic acid. After completing the first 4 sets, he switches to a conventional triceps push-down bar, uses a pronated grips (palms facing the floor), and knocks out 3 more sets of 15-20 reps.
Today's triceps workout ends with 4 sets of seated machine overhead triceps extensions. Bev's Gym has a few such machines to choose from, each with a slightly different grip configuration. Williams squeezes his massive frame into one and, with his hands 6-8 inches apart, gets to work. As in all his triceps exercises, he avoids a complete lockout at the top of the movement. He maintains control of the weight throughout the range of motion, and you can almost see his triceps getting more pumped with each rep. He completes his workout with 4 sets of 20 repetitions. Tony Monchinski, Ph.D. is a former competitive powerlifter who has been involved in the weightlifting industry for over 30 years as a writer and creative consultant.